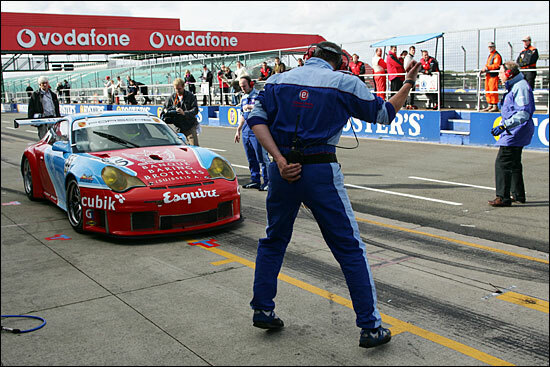 With Embassy and Eurotech on equal points going into the final race for 2005, Embassy had the advantage in terms of grid position, but their Porsche was burdened with 60kg of success ballast compared with an unladen Eurotech car. 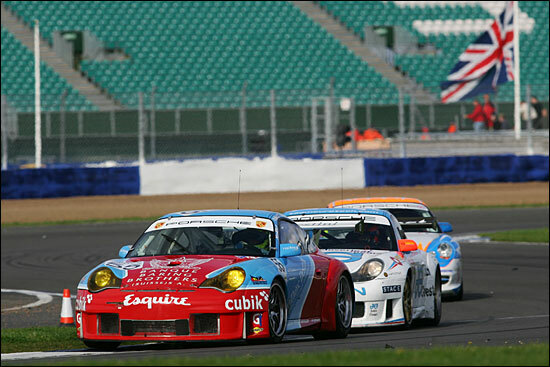 These two teams really made the GT2 race on Sunday, proving to be a high point in an otherwise relatively processional affair. 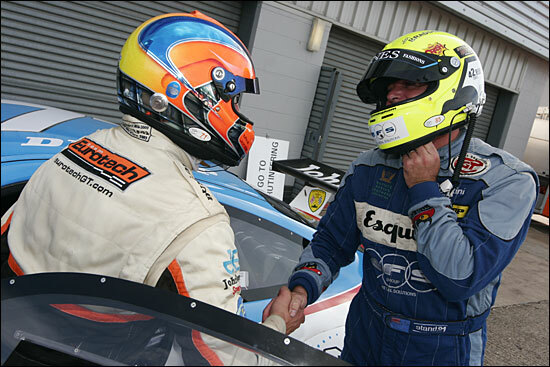 Ben Collins duelled with Michael Caine throughout the opening stages of the first stint, then a recovering Mullen and Keen interloped, before passing both of them, and leaving the duo to scrap it out again. Mike Jordan took over where Caine left off and really brought the fight back to Neil Cunningham, lapping lap after lap right on his bumper, then backing off and trying one last time, but not being able to overcome Cunningham’s gritty resolve. Sunday’s race started on a dry circuit, under a bright sky, with light clouds pushed along by a moderate breeze. Conditions couldn’t have been much more different to Saturday’s wet race, but once again Embassy proved they could adapt to conditions and produce a car that would be quick and competitive. Neil and the Embassy girls played their parts in making GT racing that bit more interesting, for old and young alike. From the off, it looked as though things might go even better than anyone in the team had dared hope for. Ben Collins describes the start: “It was awesome, I actually led Kirkaldy, but not for long! That Mosler has so much grunt, I just don’t know where it gets it from. The Ferraris were off from the start but I stayed quite close to them, but then the Mosler just tore up the inside of all of us. So they were three abreast into the first corner and I knew that wouldn’t work, Keen hit Kirkaldy and knocked him into Mullen who went off, it was all a bit crazy, but I managed to ziz-zag through it all and ended up on the outside of Kirkaldy, outdragging him on the way to Becketts, then Keen went off all on his own. It was like Christmas come early. 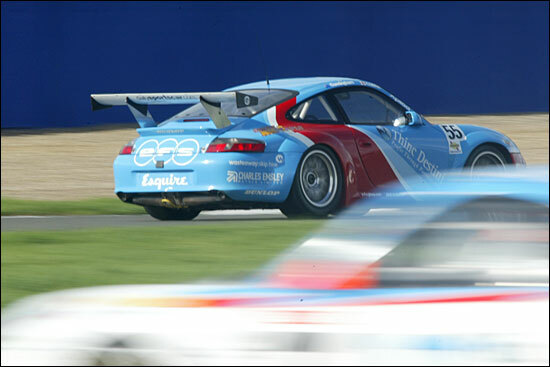 I thought about trying to hold onto first, but the job was to beat the Eurotech Porsche and it would have been too much hard work trying to stay ahead of a car that was two seconds a lap quicker than us. 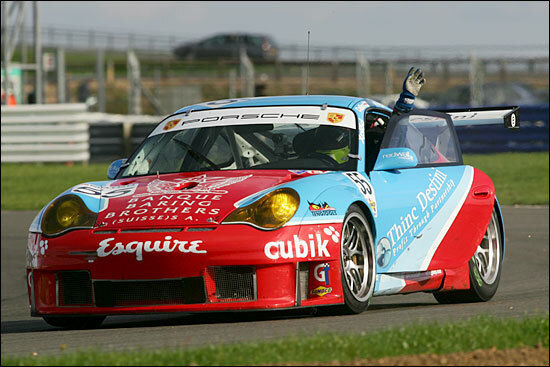 The only time Collins didn’t have the aggressive jutting chin of the Eurotech Porsche within a second or so of his rear wing was when the recovering Mullen and Keen swallowed first Caine then Ben himself, neither Porsche man risking their title fight and just letting them go. Caine was the first driver to head for the pits and a driver handover, so his team-mate Mike Jordan would have a little over half of the race to try to get ahead, and stay ahead, of Embassy. Embassy had a slick stop, whereas Eclipse’s Steve Hyde and Scuderia Ecosse’s Chris Niarchos somehow lost time and positions to both Porsches, so it would be Kinch, Cunningham and Jordan in that order right through to the flag. Kinch may have been out on his own up front, but Neil Cunningham bore the brunt of enough pressure to last an entire racing career. Within a lap of joining the fray, Cunningham’s four second lead was reduced to two, then just one, and Jordan’s relentless pace looked like it might prove irresistible and unravel Embassy’s championship aspirations. 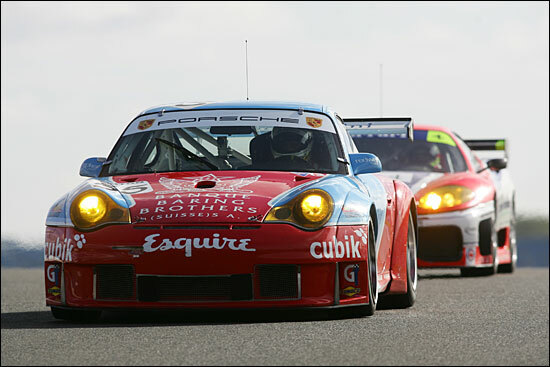 For the final twenty minutes of the race, Neil Cunningham’s eyes must have been out on stalks – watching every move that Jordan was scheming behind him, whilst picking the quickest defensive driving line he could manage. And so it was that Jordan, sometimes close enough to rub bumpers and never more than a second away, could not quite get his nose his front. Cunningham scythed through the traffic, picking out car after car, never lifting, never slowing, never moving off the perfect line. Jordan backed off just prior to one last push, the circuit commentator suggesting he would settle for third, but no-one connected with Embassy was convinced. This last push was to be a big one: despite pounding some well worn tyres, he steered the car to its best lap of the race so far - a 1:23.9 with just two laps to go. Cunningham responded immediately, with Embassy’s quickest lap of the day at 1:24.569, and although Jordan was faster, he was not quite fast enough. 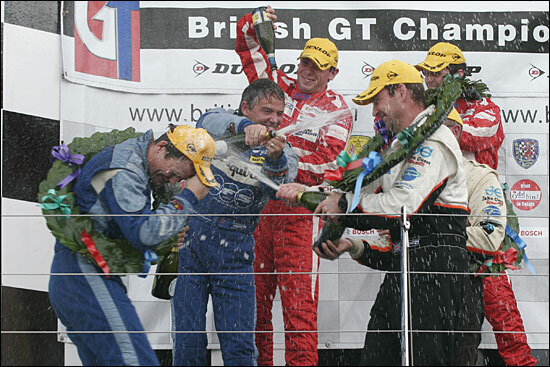 Cunningam blasted across the line 23 seconds down on the leader and took second in the Teams’ Championship. 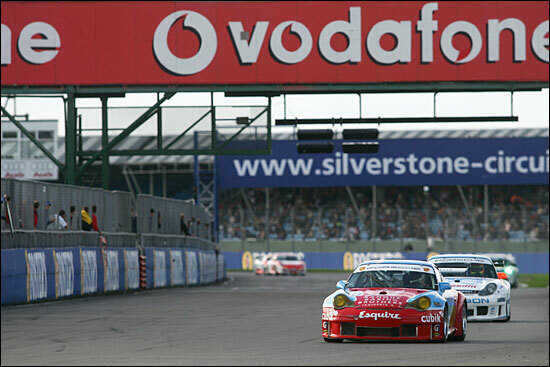 The Championship had therefore been decided by just eight tenths of a second, after many hundreds of miles of racing throughout the season. 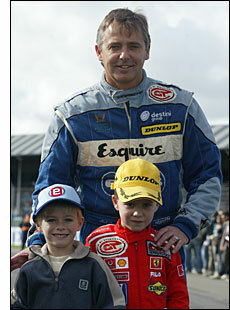 Embassy also netted third in the Drivers’ Championship into the bargain. Having proudly watched his two ‘Galactico’ drivers at the press conference, Jonathan France tried to regain his composure – the normally unflappable Yorkshireman was literally trying to get his breath back – had he inhaled any oxygen at all in that last tense 20 minutes of the race? It didn’t look like it. It is clear from the results obtained this year that Embassy Racing now functions as a top-class racing team, and that any early niggles that, realistically speaking, had to have been expected, have now been resolved. This puts Embassy in a highly enviable position and it is with great interest that the motorsport world awaits Jonathan France’s plans for the immediate future.